The American Community Survey (ACS) was conceptualized as a replacement to the census long form, which collected detailed population and housing data from a sample of the U.S. population, once a decade, as part of the decennial census operations. The long form was traditionally the main source of socio-economic information for areas below the national level. The data provided for small areas, such as counties, municipalities and neighborhoods is what made the long form unique, and what makes the ACS unique today. Since the successful transition from the decennial long form in 2005, the ACS has become an invaluable resource for many stakeholders, particularly for meeting national and state level data needs. However, due to inadequate sample sizes, a major challenge for the survey is producing reliable estimates for smaller geographic areas, which is a concern because of the unique role fulfilled by the long form, and now the ACS, of providing data with a geographic granularity that no other federal survey could provide. In addition to the primary challenge associated with the reliability of the estimates, this is also a good time to assess other aspects of the survey in order to identify opportunities for refinement based on the experience of the first few years. 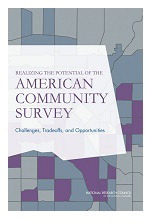 Realizing the Potential of the American Community Survey provides input on ways of improving the ACS, focusing on two priority areas: identifying methods that could improve the quality of the data available for small areas, and suggesting changes that would increase the survey's efficiency in responding to new data needs. This report considers changes that the ACS office should consider over the course of the next few years in order to further improve the ACS data. The recommendations outlined in the report will help the Census Bureau improve performance in several areas, which may ultimately lead to improved data products as the survey enters its next decade.